It is the beginning of a new and exciting year for all of us - time to remind everyone of the school traffic safety regulations. Remember, they exist to avoid children getting hurt or endangered and for the traffic to run as smoothly as possible. Both parking lots at Walton Elementary are for staff exclusively. You cannot park there, not even briefly. Drivers may use the drop-off lane in front of the school main entrance in the morning. Enter the upper parking lot, move as far forward as possible, let your child get out onto the sidewalk, leave immediately. Do not turn left out of the parking lot. Do not double park or obstruct the exits. Please wait your turn in line. You cannot park or leave your vehicle, not even briefly. If you want to accompany your child to the classroom door, you need to find parking out on the street and walk him or her from there. If using the drop-off lane, have the students ready to get out, with schoolbags, rain gear etc. within reach. Watch out for pedestrians crossing the parking lot. The use of the pick-up lane is limited to school buses and daycare vans from 2:30pm-3:00pm. Daycare operators serving Walton Elementary can request a daycare pick-up application pass, valid for the current school year. Contact the school office for an application form. 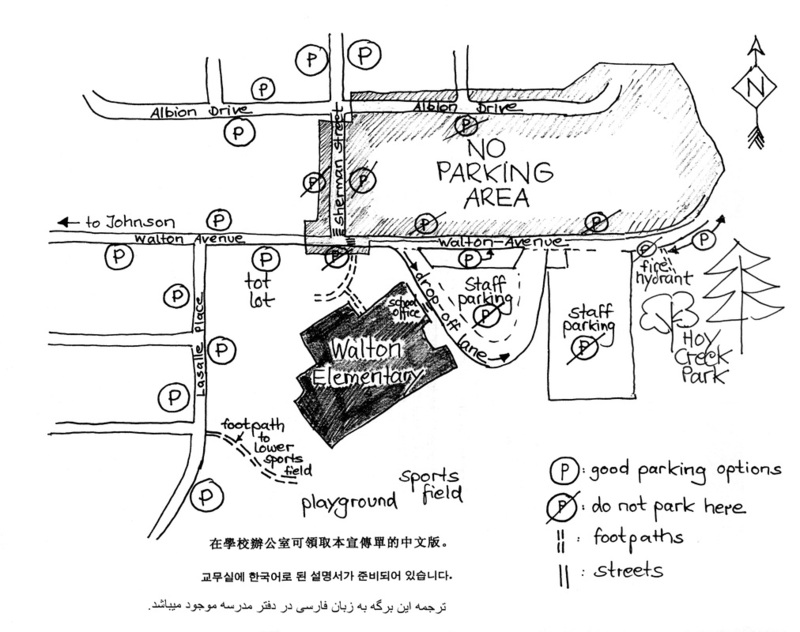 Please acquaint yourself with the legal parking areas near Walton Elementary (click the Traffic Zone Map button above). Do not park or stop on the crosswalk on Walton Ave (within the narrowed part). We need passing traffic to have a clear view of the crosswalk and the people using it. Good parking is usually available up Sherman Street, on Lasalle Place (use the footpath cutting through to the lower playground) or along the school side of Walton Avenue. Come early and bring rain gear or snow boots when necessary. Do not park or stop on the north side of Walton Avenue (opposite side from school). We need to avoid blocking the road, with cars waiting to turn left into the parking lot. Jaywalking Walton Ave. is very dangerous during busy times. Always use the crosswalk when crossing Walton Ave. and teach your children to do likewise. Parking is also not allowed on the first part of Sherman Street up to the first intersection, the right branch of Albion Drive (residents only) and in front of the fire hydrant below the lower parking lot. Respect the 30 kph speed limit on Walton Ave. Do not attempt any U-turns on the t-shaped intersection of Walton Ave. and Sherman St. and never stop or park there, endangering pedestrians. Our neighbours ask you please to respect their driveways when parking in the area and refrain from idling your engine while waiting. … and may issue tickets. Please drive safely and treat each other with consideration and courtesy. Thank you!